Every year more than 2,000 workers are admitted to hospitals because of burn injuries, flash fire accidents, molten metal splash burns and electric arcs. Reason for these injuries is often lack of proper personal equipment for workers at workplaces. Many of the workers in manufacturing and industrial workplaces don’t wear proper personal protective equipment (PPE) ultimately resulting in workplace accidents. Keeping in mind about workplace casualties, the Regulatory Authorities have made mandatory for companies to provide flame retardant garments to their workers in work environments where possibility of hazardous incidents is high. Saving the lives of workers at workplace should be first and foremost priority. Now the question is to select the right protective fabric for your workers to keep them safe. When choosing a flame retardant fabric; it’s always important to select that fabric which provides optimum level of protection by safeguarding against the hazards, particular to the specific work place. Also, the environment in which the garments made out of flame retardant fabric are to be used, should be considered closely so that the fabric not only provides best protection but at the same time it also fulfills the aesthetic needs. The very first step in selection of the suitable flame retardant fabrics is assessing the risks involved at a workplace so that all risks should be discovered. This could be done by hired professionals who carry out a detailed examination of your facility and whom can consider the risk containing factors involved, the extent of damage to be expected against heat and flame in a sudden burst of flash fire, electric arc, molten metal splash or other workplace hazards and the degree of protection required. One needs to analyze these core factors to make sure the FR workwear you’re buying will provide adequate protection against all of these. It’s the job of the safety professionals and employers to identify all kinds of potential physical or environmental hazards associated with the workplace and against which the workers might be exposed to, so that the most appropriate flame retardant garments could be selected for their workers. When buying flame resistant clothing, your workplace climate acts as one of the most critical factors to consider. A variety of workplace hazards with different intensities and exposure levels always put workers in risky scenarios. The kind of protective garments you choose for your workers to a certain degree will be dependent on whether you work in cold or hot weather conditions. The risk of heat stress or frost damage obviously require different sort of FR clothing so that optimum blend of protection and comfort could be attained. So, make sure you predefine your workplace climate before selecting any FR fabric workwear. Relating to workplace accidents, protective garments have become a compulsory requirement for workers almost in all industries, and every workplace has its own safety standards which specify the type and level of protection that FR garments should provide. Whatever FR clothing you choose, it must live up to your industry certifications and also the local safety standards set forth in the country where the work is taking place. Protective clothing for use in welding and allied processes. For fabrics’ protecting against welding, and the critical test factors are: Flame spread, Impact of splatter (of metal), Heat transfer (radiation), Electrical resistance, and Tear, tensile and burst strength. NFPA 70E requirements for safe work practices to protect personnel by reducing exposure to major electrical hazards. Originally developed at OSHA’s request, NFPA 70E helps companies and employees avoid workplace injuries and fatalities due to shock, electrocution, arc flash and arc blast. ATPV – Arc Thermal Performance Value will tell you the energy that the fabric will insulate against in a case of an electric arc in Cal/cm². It is tested by measuring the amount of energy needed to transfer enough heat through the fabric to cause a second-degree burn. Ebt – Energy break-open threshold measures the energy needed to cause the fabric to break open and allow the heat to contact inner garments or skin. Protective clothing against the thermal hazards of an electric arc. For fabrics’ and garments’ protection from the thermal hazards of an electric arc. Electrostatic properties – charge decay. Fabrics’ potential or ability to get rid of (dissipate decay charge on its surface) the static electricity charge. When it comes to FR workwear fabrics, you’ll find plenty of them in the market. There are different types of FR fabrics available depending upon requirements of various industries. Some of the FR garments are inherently flame retardant while others are chemically treated Breathability of the fabric is a critical factor to be taken into account especially for those working in an environment that presents potential heat stress. Whereas some jobs demand light weight fabrics, for others durability may be more important. So a blend of different fibers can be used to come up with a product that not only satisfy the protection needs but at the same time also fulfills the aesthetic requirements. Here are some of the commonly use fibers with their characteristics that serve as raw material to come up with a FR fabric. See which appeals more to your with respect to your workplace requirements. Cotton is tough to beat for natural comfort, versatility, strength and performance. It tends to resist heat, and insulates against both heat and cold. Its fibers transport water and sweat, making it breathable with good antistatic properties. It blends well with synthetics and can be dyed in nearly any colour. Cotton does not shrink in flash fire. It is low cost and easily accessible compared to other fibers. Polyester can be used for its strength and the low absorbency that make it stain resistant. Polyester is not an FR fiber but gives FR fabric very good stability and low washing shrinkage. Polyester can be dyed in all kinds of brilliant colors with high colorfastness. It also improves the fabric’s abrasion resistance. Polyamide is extremely strong and waterproof, able to repel oil and some chemicals. It is not a FR fiber but gives FR fabric strength and durability as well as very good abrasion resistance. Aramids (aromatic polyamides) are widely used in FR clothing. They are inherently fire retardant. Meta-aramids are tremendously resistant to heat, abrasion and organic solvents. Para-aramids can add incredible physical strength to a fabric. Modacrylic is a FR fiber, which is soft, stable and hard-wearing, easily dyed, and quick to dry, with great resistance to solvents and chemicals (as well as wrinkles). It’s moderately abrasion-resistant, but naturally self-extinguishing, moth and mildew-free, non-allergenic, and has properties that can help block electric arc. It is mostly used in a mix – commonly 40 to 60% – with other fibers for improved FR performance. Lyocell is a regenerated cellulose fiber. It is soft and strong, with good heat resistance to insulate against both heat and cold. It absorbs and transports moisture even better than cotton and therefore has good antistatic properties. Lyocell can be dyed in nearly any color. Its fiber strength is good for a non-synthetic fiber. Lyocell does not shrink in flash fire. Carbon/steel fibers are used in FR fabrics for their antistatic properties. Each fiber has advantages to bring to FR fabrics, if you are guided by expertise in using and blending them. Daletec’s specialists are eager to ensure you find the best fabric for your purpose; our clients tell us this is one of our most helpful and useful services. Fabric- and garment durability can have very different meanings, but their ultimate focus should be providing better protection to workers, take full advantage of the lifetime of a flame resistant garment and lower the replacement costs. To ensure FR clothing is providing adequate FR protection against hazardous materials & chemicals in workplace, one must confirm the durability of protective FR garments before making a purchase. What fibers make up the fabric and garment? Blends that incorporate more durable fibers such as nylon and aramids give fabrics more resistance to abrasion, and higher tear strength, providing better and long-lasting durability. How is the fabric constructed? Every single detail of the fabric construction will affect the durability of FR fabric and garment. For example, a twill weave may be more durable as compared to a plain weave, more number of threads may have higher tensile strength, but less number of threads may have higher tear strength. The combination of weave, threads, yarn count and weight of fabric all play a role in determining a fabric’s ultimate durability. The FR performance of the apparel is one of the most important factors that should be looked into while selecting from the available options. EN ISO certificates can be achieved after 5 wash cycles but that should not be the limit. The garments have to undergo many more washing cycles throughout their life cycle and the FR performance of the fabric used to make these garments must have durable FR performance so that when washed for multiple dozen times, the protection does not fades away. This is where Daletec takes pride in the way it applies FR performance to its fabrics that are permanent and remains intact throughout the lime time of the garment, as long as prescribed washing instructions are followed. How is the garment assembled? As with the fabric, garment construction details like garment design, seam type, fit, trims and features can make a contribution to durability, but no single attribute should be selected as the determining factor for durability. It’s important to make sure you follow the proper instructions for the flame retardant fabrics which you’re buying. Proper care must be taken while washing them. For instance, washing them with regular chlorine bleach will affect their protective properties and may result in reducing or even removing FR properties. All detergents sold for home use can be used except for ones containing hydrogen peroxide, sulfuric acid and other chlorine containing chemicals that will not only effect the FR performance but also will result into challenges like drastic color change. Usually, it is recommended to launder FR fabrics at dedicated laundry facilities but most flame-resistant garments can be handled safely using common laundering and care procedures. Remember, FR clothing is safety apparel that just might save your life. To keep your flame-resistant garments in excellent shape, it is important that the prescribed washing temperature, drying procedure and other care instructions by the fabric supplier must be followed. Similarly, as far as repairing of flame retardant apparel is concerned, special treated thread and fabric patches must be used while keeping in mind that safety requirements aren’t compromised. Still, there are some safety measures that need to be followed to ensure your FR garments maintain their maximum effectiveness. Some suppliers recommend washing newly bought flame resistant (FR) garments before wearing. Wash flame resistant (FR) garments separately from your everyday clothes. Don’t use chlorine bleach, hydrogen peroxide, or other chemicals that the fabric supplier has recommended to avoid during washing process. These days, you’ll find flame retardant fabrics everywhere. Garments made out of these are used to provide protection in different sectors of everyday life. And honestly they’re doing pretty well, but majority of them are encountering a similar problem; “washout”. Regular spot tests show that many flame retardant (FR) fabrics burn after only a few washes. Garments made out of these are the last line of defense, so it is really important that the credibility on the FR performance of the fabric is never compromised. Never choose a FR garment that may burn after few washes. Always select those protective fabrics which can document FR certifications and guarantees to remain flame resistant throughout the lifetime of the garment, because that’s what you’ll be looking for. If your workers like the way their FR clothing looks and fits, they are more likely to wear it. Fortunately, FR clothing manufacturers have made significant improvements in style over the number of years by coming up with designs that are more appealing and still meet the relevant safety standards. These days’ people are also inclined towards looks and fashion along with protection, therefore FR product lines have been updated to provide newer and trendy FR garments. One of the most recent FR innovations is improved FR clothing design with a more casual and comfortable feel. As we say confidence is often linked to feel good in your own skin, but a nicely designed FR workwear can often do the job too. A variety of new inspiring FR garments are now available. So, when buying flame retardant garments, whether inherently or chemically treated, remember to choose the one that’s trendy. Being uncomfortable can put your workers and workplace both at risk. When your FR garments are not comfortable, the workers will be more likely to take shortcuts ultimately resulting in workplace accidents. By choosing the right flame resistant garments, your workers will be more likely to wear them. This will not only increase compliance to FR safety regulations, but it will also increase productivity, reduce the chances of workplace hazards and improve workers morale. Lastly, there are some FR fabrics in the market which rough hand feel, ultimately resulting in irritation over skin when applied in direct contact with. As a result, skin safety along with comfort has rapidly become a key factor in a wearer’s purchasing decision. Make sure you buy those FR garments which can be worn comfortably against skin without causing any irritation or problem. Therefore, keep all of these attributes in mind before making a purchase. How comfortable is the flame-resistant garment? Is the FR garment right weight, breathable and flexible? Does the feel of FR garment distract you from your work? Quality never happens in a day. It takes months, years and even decades to establish oneself as a quality manufacturer. Similarly, a manufacturer’s credibility is dependent on the safety of its products along with the level of trust of its customers. Nowadays, you see so many FR fabric players in the market claiming top notch FR protection, but when you take a closer look at their quality and level of protection against various workplace hazards; you’ll be surprised and think twice about the claims they’re making. Remember, a credible FR fabric manufacturer never compromises on two things; safety and consistency of its FR fabric. As a matter of fact, a low-quality FR workwear mostly leads to serious fatal injuries or workplace causalities. Therefore, make sure you buy from a reputable FR fabric manufacturer and always pay for a good quality FR fabric because it’s gonna pay off in the long run. 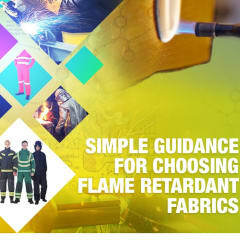 Make sure to use these simple guidelines for selecting your flame retardant fabrics wisely. Daletec is the trusted Norwegian producer of flame retardant fabrics for clothing that protects against heat and flames, electrical arc and hot metal splash. We have pioneered unique processes and specialized FR treatments for more than 40 years, including impregnations, laminations, special coatings and other innovative FR technologies.